Blood Orange by Karen Keskinen, a Mysterious Review. Review: Santa Barbara private investigator Jaymie Zarlin finds missing persons. 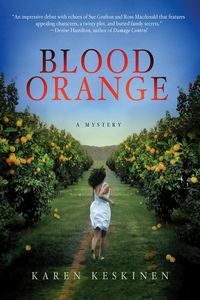 But when she's asks to help prove that Danny Armenta, a teenager with a mental disorder, is innocent of murder, she can't help but get involved, in Blood Orange, the first mystery in this series by Karen Keskinen. Danny was found sitting and mumbling next to the body of Lili Molina, a Mexican teenaged girl, a knife at her side. The police arrest him and look no further. Gabi Gutierrez, Danny's aunt, is an illegal working mostly as a housekeeper, but is willing to take on any additional job just to pay Jaymie for her services. Jaymie's first (of many) stumbling blocks: the jurisdiction of where the body was found. The city is conducting the investigation but the body was actually found in an unincorporated area, which is legally policed by the county. Deputy Sheriff Mike Dawson agrees to help Jaymie, sending her information about the murder that would have been nearly impossible for her to obtain on her own. Her investigation leads to the Apollo guild, a network of some of the wealthiest and most powerful men in Santa Barbara, who had sponsored the Solstice Festival on the day Lili was killed. Everyone there alibied everyone else, though Jaymie is sure someone there is guilty of murder. Blood Orange is an interesting book, though the primary storyline seems more focused on the problems of illegals in the US, race discrimination, and the ills of poverty than on solving the mystery of who killed Lili. A secondary plot involving Gabi and a missing dog is much lighter in tone, helping to balance the frequently darker elements of Jaymie's investigation. Special thanks to guest reviewer Betty of The Betz Review for contributing her review of Blood Orange. Acknowledgment: Minotaur Books provided a copy of Blood Orange for this review.